As folks who pride ourselves on mixing the practical, inspirational, and whimsical, we feel a certain kinship with the makers of , artfully designed field guides to American cities. There's a vintage charm to the voice and cadence of the books, but the information — from things to do and see and eat, to interviews with local icons, to almanac-style trivia — is fresh and modern. So far, they've covered Nashville and Austin. 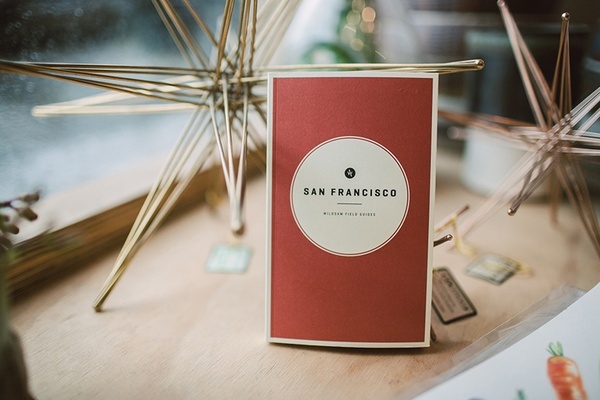 This week, they launched Wildsam Field Guide: San Francisco. 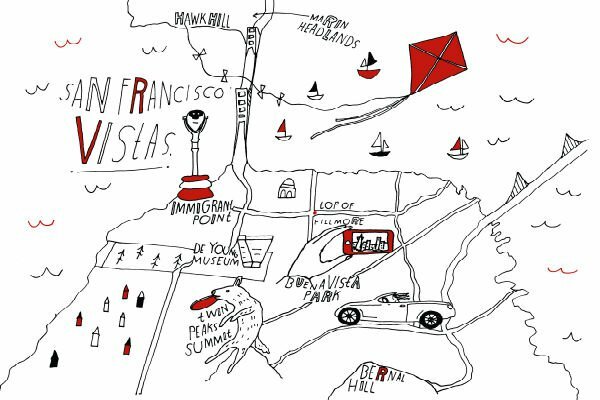 Editor Taylor Bruce was kind enough to share his personal San Francisco treats. But first! We had a few questions for him about the new edition. 1. How did you prepare your research for the SF edition? From April to September, I took regular three- to four-day trips into San Francisco. They started with a few conversations with friends, like Jay Carroll, who works at Levi's, or my pal Caren Kelleher, who manages bands and works at Google. But I never plan too much. Part of the secret of good travel is letting the place guide you. Otherwise, I never would have met people like Castro flower seller Guy Clark or Reverend Glenda Hope, the Saint of the Tenderloin. 2. How did you corral such amazing contributors. (Hello: JOAN DIDION?!) Ms. Didion is a hero of mine, so when we first decided to do SF, including some of her groundbreaking magazine pieces from the late '60s was our home run swing. "Slouching Towards Bethlehem" sits right next to "Frank Sinatra Has a Cold" in my opinion. It's a masterpiece. Our friends at The Paris Review kindly made the introductions. Months later, we're still smiling ear-to-ear. 3. What were some challenges you faced with putting this edition together? Well, first off, I've never lived in San Francisco. And you just can't replicate that kind of familiarity. Luckily, we made a lot of good friends fast. Secondly, as incredible as San Francisco is — with its tech future-builders and those dreamy hilltops — it's also a city desperately trying to stem a wave of cultural erosion. Skyrocketing rents and some dicey legislation are ripping whole neighborhoods apart overnight. That stuff is really complicated. 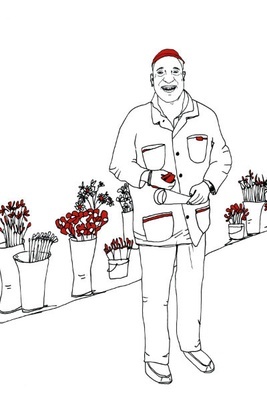 But with our field guides, we want to look those urban stories square in the eye. 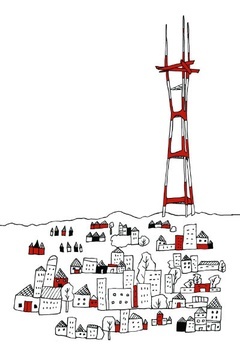 Lastly, even though it's a relatively young town (in 1849, the population grew 40 times over), SF's roots reach deep. The risk is missing some vital corner of the cultural attic. I just hope we do the city justice. It's a magical place. Open-water swims minus wetsuits or fins at the historic Dolphin Club aren't for the faint of heart. Bay temps in the '50s don't deter members of the throwback swim house, begun by German immigrants in 1877. I grabbed a daypass to celebrate the SF field guide's completion. With rad outfitter Mollusk and artisan board maker Danny Hess, the Outer Sunset is SF's sleepy surf town. Before walking to Ocean Beach, locals hit Trouble for the bold brews and some epically thick cinnamon toast. The 18-seat seafood counter hasn't won any beauty contests since opening in 1912, but eaters line the block for the famous Dungeness chowder and a plate of oysters on ice. Swan's feels like a Sicilian fishing family docked their boat on Nob Hill and never left. Sanchez St. to U.S. Route 101, Duboce Ave. to Cesar Chavez St. This neighborhood-of-the-moment is stocked with modern mom-and-pops you won't find anywhere else — from casual men's clothiers, Taylor Stitch, and American made curators, Voyager, to indie tastemakers at Gravel & Gold and the exotic taxidermists at Paxton Gate. Driving over the Golden Gate, take your first left and wrap around into the Marin Headlands, the lush preserve that offers the most breathtaking vistas in the Bay Area, foggy or bright-skied. We climbed Hawk Hill with the blue butterflies and Instagrammed our heart out. Three miles east of Sonoma and up a dusty, palm-lined trail is Andrew Mariani's vineyard, Scribe. The young winemaker throws parties at the century-old hacienda and opens his shady hilltop yard (with the best rope swing anywhere) for the wine country vibe everyone imagines — but rarely finds. Chef Melissa Perello's charming corner café is one of SF's toughest tables, though the room is wonderfully airy and California casual. Head there early and cozy up in a window bar for the house red (dollar-an-ounce! ), the bacon beignets, and whatever risotto Chef's got on the menu. Admission: I never miss her warm lumberjack cake. This compelling stage series started by The New Yorker contributor Douglas McGray "brings a magazine to life" — putting writers, filmmakers, et al, into a 100-minute live performance. Previous cohorts include Wired, ESPN The Magazine and McSweeneys. Lots of killer bars popping up in SF (including Trick Dog and Bar Agricole) but Pappy devotees gather round this new watering hole's bright, horseshoe-shaped bar in a vaulted space on the Embarcadero. Deepest whiskey cabinet in town. That perfect boutique hotel in SF? Tough to find in the city of Airbnb. This year brought a welcome option in the ever-chill Presidio, where they restored a former captain's dorm to a level of coastal style and comfort those gents never dreamed of. Taylor Bruce is the creator of Field Guides. You can follow him on @iamwildsam. He travels for the meaningful conversations.